The LS9 engine swap has begun! The LS3 is out of the car and ready for some test fitting. Check out our ZR1 Pantera blog for awesome updates on the project as it's coming along! We can't wait to get out on the track in this beast. It will be pushing over 700HP of reliable power at the crank! Very nice! You have to have a set to go against the Pantera purity community who will surly condemn you straight to hell, in your rear view mirror. What will you be using for an ECU? Also, do you have enough room at the front of the engine for the throttle body and air filter? If not, how will you resolve the problem? Do you need to make any other major changes, going from the LS3 to the LS9? I'm looking forward to watching your progress. We are using the MAST Motorsports wiring harness and computer that is tuned very nicely for the LS9. We are planning on running the supercharger, air filter, and throttle body in its stock location, unlike our LS3 which had it reversed. So far it looks like the LS9 will not be any more difficult than the LS3. We are planning on doing a test fit with the engine this weekend to see how everything fits in the engine compartment. Thanks for your interest in the project! It's going to be getting very exciting within the next few weeks! This is super cool! Please do keep us updated with your progress. does that bell housing work for both the ls3 and ls9? Yes, the same bellhousing will work for both engines. 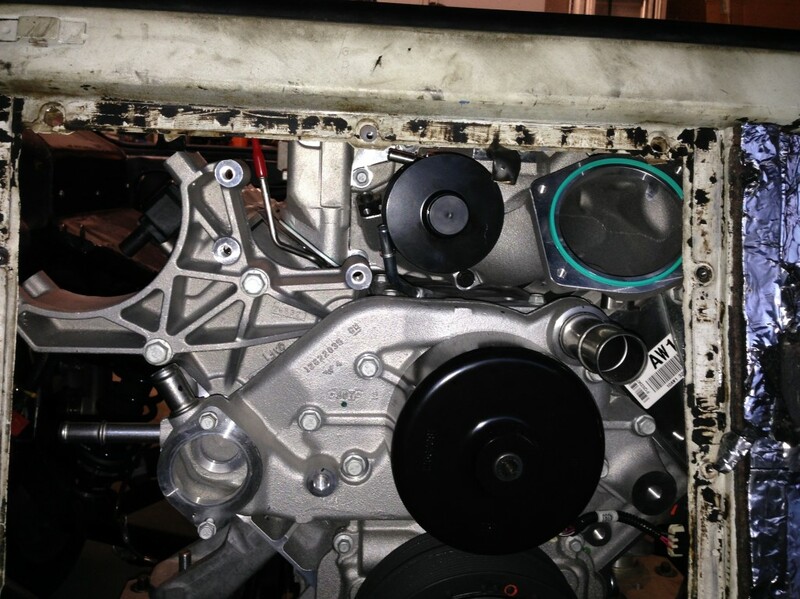 The LT4 is an awesome motor for sure, but, the LS9 has more HP with a tad less Torque. So over the past two weeks, we have been hard at work in getting the LS9 ready to go into the car. Last weekend, we started disassembling the LS9 so we can get it into the car. We took off the flywheel, exhaust manifolds, and the blower. 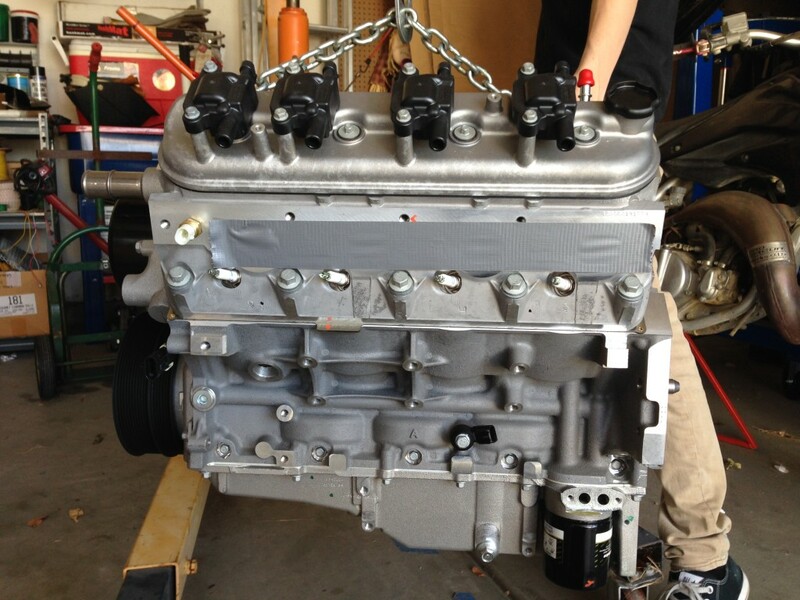 The LS9 and LS3 block and heads are almost identical on the outside, but on the inside, they are completely different. Many people believe that the LS9 is simply a supercharged LS3, which it certainly is not. 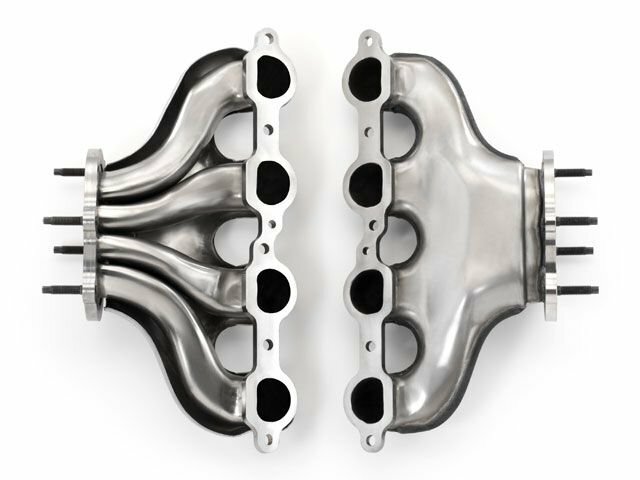 The LS9 was engineered to handle the massive amount of boost the engine will be putting out. The LS9 supercharger is AWESOME. 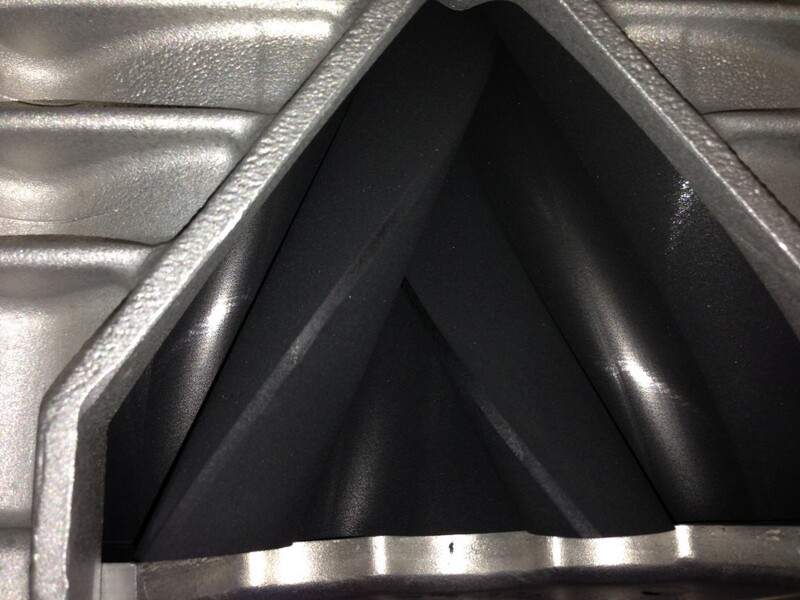 When you look inside of the blower, you will see just how beefy the rotors are. 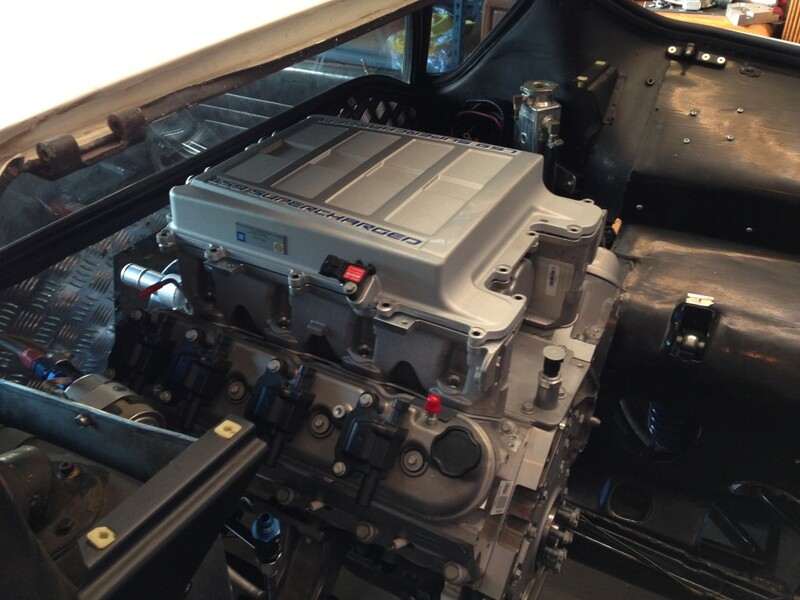 We put the LS9 into the car today without the blower and it fit very well in the same location as the LS3. When we attempted to put the blower on, there was not enough room for the front drive snout and throttle body under the window; which is an issue we knew we would have what with the increased height of the engine. In the picture that we have with the engine in the car, we removed the snout so we could see what the engine would look like when sitting in the car and boy does it look cool. Our workaround for the throttle body issue is to lower the motor about 2.5 inches to make up for the lack of space behind the firewall. This will provide a few benefits for us: it will lower the center of gravity to provide enhanced handling when cornering & it will allow us to not have to modify the car to allow the pulley's and throttle body to fit behind the firewall. Next weekend we will be lowering the motor and working on getting the front-drive system installed. Stay tuned! Lowering the engine that much, are you going to use a "flipped" ZF? Hopefully we will not have to. It's not in our plans, but if need be, we will. It looks like the engine will be able to be angled enough so we won't need to. In other news, we got the engine lowered an inch and a half this weekend and everything fits pretty good! Way better than we had anticipated. We've updated the blog with a few more pics too. I know what you mean, I have to say a prayer and burn a candle every time I read this thread. I bet if Ford pissed him off or Chevy made him a better deal we would have ended up with a 350 in our cars who's to say. I have to admit I am not gung ho for this swap either but it is much more tasteful than some of the stuff I have seen pantera owners do. One car comes to mind is the red roadster I posted a while back. YUK. At lease Scott will end up with a smooth running reliable and extremely powerful car when he is done. Most of all he is doing this because its for him and not for resale etc. I will take that old worn out LS3 off your hands for my Pantera. I could probably scrape together a couple hundred bucks. Heck, I would even throw in a case of beer too. On a serious note, I think the LS9 swap is great. I would love to be able to do this to my Pantera. I would even be very pleased with a LS3. However, I am also the guy that joked about putting a LS3 into my 65 Fastback. So what is your next project that your putting the LS3 in? all kidding beside, for a purist like me it's ofcourse not done. Sure not when wants to keep the value one can expect.Changing brand of engine makes it a "kit-car" , which can be great , but only for the owner.His "market" for resale will become smaller and smaller , but it is his decision and he has the right to do so. Belgiumbarry, do we then agree it's not enough it's a Ford engine, it should be a Cleveland? I can tell you right now there are a TON of people that would want this car with the LS9, not just the "owner". But who ever said anything about resale value? That is not what this project is about. This car is NOT for sale, nor will it be in my lifetime. It is nice of you to be concerned about my financial well being. I am glad we can agree that it is my decision since this is a free country and it is, after all, MY CAR. By the way, I could EASILY put the Cleveland back in the car if I ever did decide to sell the car in the unlikely event that hell freezes over. And in latest news, workers have been seen making repairs to the the grave site of Henry Ford. Apparently fixing the damage from the resident of the grave doing back flips! I'm only kidding by the way, it is a great engine and it will be a quick pants tearer for sure. Well stated Scott. LMAO Like I said we very well could have have Chevy engines in our cars. Think ISO and Bizzarini. I bet Alejandro was not that married to the Ford marque. Most likely its the best offer he had at the time. This car is NOT for sale, nor will it be in my lifetime. One of the reasons I bought a Pantera is so I could do what I wanted to the car without being looked down on by others. I guess this may not be true in some cases. I enjoy my car MUCH more than an original car. Its different. It has character. Oh, and its fast. IMO, if you want original, go buy a vette or Ferrari. Scott, when hell freezes over, let me know what you're asking. I would certainly be interested. When you're done with the install, take a video of you driving the car cross country, smooth and reliable and also being able to smoke 95% of the cars on the road. i do not agree with buying a vette or Ferrari . What have those cars that a Pantera hasn't ? Why not buy a Ferrari and swap a LS9 ? The same story... i think i know, and without beeing pretensious , the pantera is one of the cheapest most mean looking exotic on the market , so damned to be the basis for all kind of "rich" kitcars .Just as the cheap beetle was rebaptisd in all kind of sand-buggys and ridiculous wannebee sportscars. I ever made the same mistake, had a 500HP Viper that runs very well, i had to put on a Roe Racing blower,because i could , had 700 HP and the car became just dangerous.Yes, i could smoke 95%. Sold it. Please do understand i do not want to argue, just express my opinion and at least understand that we have some "bad" feelings everytime there's a swap in a Pantera. Everytime it loses his origine and just serves as a puzzle to what it could have been but not is.In fact , real blasphemy for the Ford Cleveland, a Ferrari with a another engine brand is just ridiculous accepted here in europe....and looked upon as a simple violated kitcar.No more , no less.Why not our Panteras ? I don't really care about your opinion. Please stop posting on this thread! This thread is a build log for people that want to see the progress of this project. It is not intended to be a thread to debate the merits of the project. please accept my apologies ZR1 Pantera ,you are right, i got carried away in my selfisch point of view which has nothing to do with the thread here.I was way off topic. Even more , i do honestly admire your skills of work and ideas . By the way, Thanks to the MANY folks that support me and my crazy ways!!! Thank you Barry for saying that!!! You are an honorable man!!! Scott and Chris missed you guys at Willow Springs last weekend. Good to see you guys making progress on the swap. That LS9 looks so cool! I remember a while back you were toying with building some 180s for the LS3 (before the LS9 project came about). What are the plans for the exhaust on the LS9? I haven't decided yet. I really like the look of the 180's but the compact stock exhaust manifolds are a work of art. They are mini headers in compact exhaust manifold. What do you all think? 180's or custom exhaust? Not only are awesome to look at but that F1 sound is amazing. webbers1972 Pantera, Restored. How do I put pic on here? 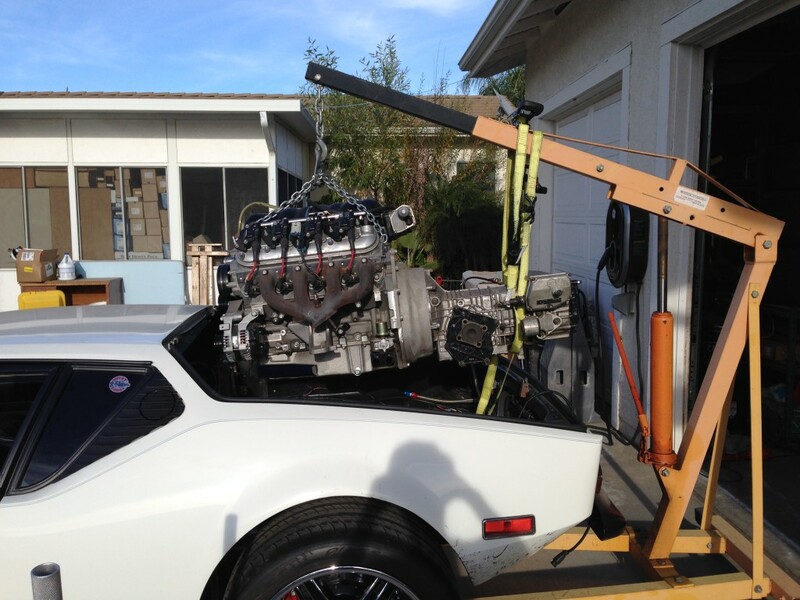 Why put a chevy engine in a Pantera?? Just because you can Is unexceptable. The 351c is more cost effective since you already have one. Easier to upgrade the motor with fuel injection, different heads etc. The cheapest bang for the buck is a stroked 302 or 351w. Lite weight too. But, of course If you can afford it, you could put any motor in. Just saying. My Apologies too. I find a lot of Panteras have different engines in them. Even a 426 Hemi. LS is a good motor.